Mas Oyama had tough hands. He routinely demonstrated his grip by crushing stone. He would place his hand on an anvil and have his assistant hit his hand with a hammer. It was not a trick. His hands were tough. He hit makiwara with his knuckles and he slapped an oak pole with his palm and the back of his hands day after day until they were tougher than oak. He developed a crushing grip through training. There are a few people around who can do this now. But very few. Sometimes people will rationalize their weakness by saying that there is more to martial arts than power. And of course that statement is true. I suspect Mas Oyama himself would have agreed. But a weak body is not an advantage. An unhealthy body is a disability. Yet we, like modern people all over the world, without giving it much thought, accept this as a natural state. In pre-modern times people often suffered from want – from famine and drought for example, and from inescapable danger – from floods or attacks from wild animals. As modern people we are much more likely to be crippled by comfort. Ancient people found ways to overcome the dangers they faced. As martial artists it is up to us to skillfully find ways to overcome the serious threats to our lives and our health that we now face. While it may seem less heroic to do battle with air conditioning or cars than it is to battle marauders or wild animals, the threat to our lives is as grave and as urgent. Many of the techniques in martial arts are simple to execute if your body is strong. They are daunting if you are weak. People do not know it. In the days when many people spent their time in labor, strength was a given. Those who wanted to excel in martial arts found ways to increase their strength far above that of people who worked in the fields, on ships or in trades. As they practiced, even in so-called internal arts, they developed power, and while the quality of the power changed from crude to subtle over the course of their career as martial artists, the health and vigor of their body was presumed. We sit at desks and consider it normal. We ride in cars to and from our desks. After work we sit and watch TV, or read, or look at the computer. For a special change of pace we go to a movie theatre and sit there, watching others do things. Or we go to a beach and sit there. So it is not unusual for people who do train to have low expectations about what it means to be fit, or what it means to work hard, or what real martial accomplishment consists of. As modern people we accept the division of labor as normal. In pre-modern times people had the skills they needed to keep themselves alive. When they were thirsty they knew where to find water, and they brought some home to their family. People knew where to find food or how to grow it, how to hunt or fish or trap their food. They knew how to find or build shelter, and they did all these things communally – sharing the most important challenges of their lives with people who experienced those challenges just as profoundly and met those challenges together for mutual good. If and when the time came that they had to defend themselves, for most of human history, people banded together to deal with the threat and then, when the battle was over and the threat repelled, they returned to their ordinary life. Nowadays we tend to delegate everything. We do not have skills that integrate us into the natural world, or engage us in necessary activity for mutual benefit with our neighbors. It makes us isolated. And it makes us arrogant. We assume that systems will all hold up forever. Food will appear in the store. Water will flow. The heat will come on in the wintertime. The a/c will come on when its hot. The TV will work. The hospitals will be open. The police will take care of the mess and then they will disappear. Maybe yes. Maybe no. How much can we afford to delegate? People don’t sing much any more. Singing is left to professionals who are good at it. To professionals who do it all the time. Who are almost freakish in their ability to sing flawlessly. But singing is good for everyone, for normal people, for amateurs, and it is good for people to do together. Athletics are done by the elite. After a few years of playing many young people are discouraged about pursuing life-long physical practice because they feel they lack the talent to make it to the majors or to earn a gold medal. So they don’t do it. But being physical, being fit, having a healthy, strong, coordinated body makes life good. Without it people feel bad. They become emotionally awkward and unstable. They suffer and are unhappy. But it is accepted as “normal” to be out of shape. Because of the material abundance of our time and place it is easy to become complacent until it is too late. Too easy to go along heedlessly until our bodies are so atrophied that a trip on the sidewalk becomes a trip to the hospital. Until we appear to be an easy target to a mugger, and we find the mugger’s judgment is true, and we find that we are helpless under the pressure of a confrontation. How much can we afford to delegate? This is what I would say to all sincere martial artists in the modern world, east or west: the world needs you. The world needs you strong and able. The world does not need any more bullies or show-offs. The world doesn’t need any more weak and dependent whiners, self-proclaimed victims or slackers. We have enough of them. The world needs, desperately, people who are strong enough to take care of themselves and the people who depend on them, with enough energy left over to help even people they don’t know. People with dignity and skill who teach effortlessly, just by their example, just by the way they conduct themselves, without any effort to influence anyone, yet whose effect is profound. That is a worthy aspiration. I encourage you to take your martial arts practice seriously and to pursue it sincerely. Do not let conventional values or limited expectations stop you from fulfilling your dreams and your potential. Don’t stop until you can crush stone with your hands. Don’t stop until you can lift the heaviest burdens off the shoulders of the people who need you. Jeffrey M. Brooks holds a Go Dan Fifth Degree Black Belt in Matsubayashi Shorin Ryu, training in Okinawa, Japan and the USA with Shoshin Nagamine, the founder of the style, Takayoshi Nagamine, his successor, as well as numerous others in the Matsubayashi Ryu lineage and related Chinese traditions. His Buddhist study and practice is with Rev. Issho Fujita, resident director of Valley Zendo and Geshe Michael Roach of the Asian Classics Institute. He has an M.F.A. from NYU Film School and works as a speechwriter for public figures. He is founder and director of Northampton Karate and Northampton Zendo in Northampton, Massachusetts, offering classes daily for adults and children since 1988. 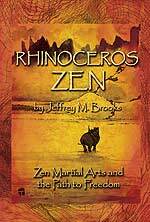 Brooks’ column, “Zen Mirror”, and other articles regularly appear on FightingArts.com.